Heat oven to 400°F. Spray cookie sheet with Crisco® Original No-Stick Cooking Spray. In small bowl, stir together butter and 1 teaspoon of the Worcestershire sauce until well blended. In shallow dish, combine bread crumbs, Parmesan cheese and pepper; mix well. Remove pizza crust dough from can, but do not unroll dough. Using sharp knife, cut roll into 16 slices. With hands, flatten each slice into 2 1/2-inch round. Brush both sides of each round with butter mixture; coat both sides with bread crumb mixture. Place 1/2 inch apart on cookie sheet. Bake 4 to 8 minutes or until light golden brown. Meanwhile, in 10-inch skillet over medium heat, cook bacon until crisp. Drain on paper towels; crumble. Reserve 1 teaspoon bacon drippings in skillet. Add onion; cook over medium heat 1 to 2 minutes, stirring frequently, or until tender. Remove from heat; stir in Alfredo sauce, remaining 1 teaspoon Worcestershire sauce and bacon. 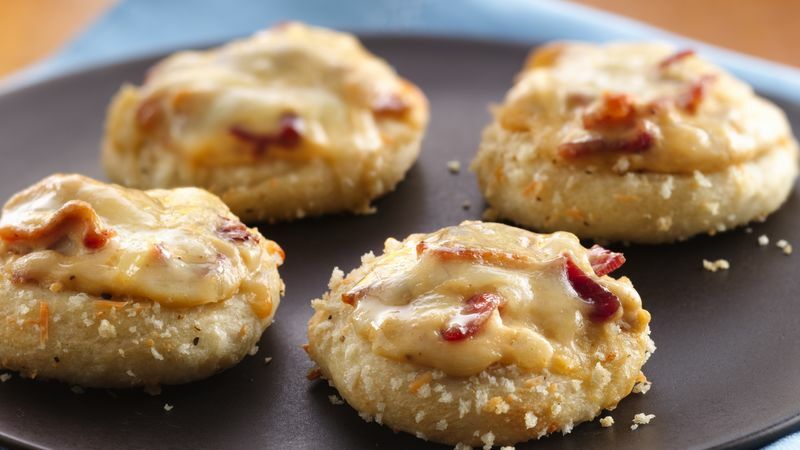 Spoon about 2 teaspoons bacon mixture onto each round; sprinkle with Gruyère cheese. Bake 7 to 10 minutes or until cheese is melted. Serve warm.